All major scientific agencies of the United States—including the National Aeronautics and Space Administration (NASA) and the National Oceanic and Atmospheric Administration (NOAA)—agree that climate change is occurring and that humans are contributing to it. Global sea level rose about 17 centimetres (6.7 inches) in the last century. The rate in the last decade, however, is nearly double that of the last century. The true impact of climate change on people and their livelihoods rarely takes center stage. For most, climate change is still an abstraction — felt, perhaps, in unusually hot summers. But for millions of people in India, climate change is already disrupting something far more fundamental- their ability to earn a living and provide for their families. From erratic rainfall to flash floods, from salinity intrusion to altered ocean currents, the impacts of climate change are forcing people to search for new livelihoods. According to the IPCC, climate change is likely to increase water demand while shrinking water supplies. This shifting balance would pose the challenge of simultaneously meeting the needs of growing communities, farmers, sensitive eco system, energy producers and manufacturers. In many areas water shortage will be less of a problem than increase in runoff, sea level rise or flooding. The flash floods in Ladakh in 2010 and Uttarakhand in 2013, the floods caused due to heavy rainfall in Chennai in 2015, and the droughts in Maharashtra in 2013 and 2015 (that affected close to 90 lakh farmers) can all be, in part, attributed to climate change. Building resilience of communities by helping them adapt to climate change. This is done by finding solutions through research, creating awareness and advocacy. There are already a lot of pressures and stresses on our existing water resources, these are likely to be exacerbated by climate change. Given that water availability from sea/ocean, due to high cost of desalinisation, is considered negligible, we have to take quick steps and adopt effective measures for water conservation. SEEDS encourages watershed development, rainwater harvesting, water recycling and reuse, and conjunctive use of water for sustaining water supply in long run in communities. Our watershed management projects involve prevention of runoff, storage and recharge of groundwater through various methods like percolation tanks, recharge wells, etc. This system of water conservation is largely beneficial to communities with scarce water resources, especially the ones that are largely agricultural. The success of watershed development depends entirely upon community participation. Thus, our projects also involve awareness building and training the communities on how to properly utilise and maintain water shed management systems. We also retrofit damaged wells and educate the communities on chlorination of water in order to properly maintain existing water resources. We promote livelihood security through improving the diversity and security of resources, skills and technologies that are available to agricultural communities. If households are to be resilient then they need adequate resources to fall back on in times of need and this means finding other ways to earn an income. If communities only have limited resources then they are likely to suffer when shocks and hazards occur as they have little else to fall back on, as they are dependent on only one or two key sources of food and income. Providing skills to communities affected by climate change, so that they can earn their livelihood through other means makes them resilient and helps them adapt to climate change. 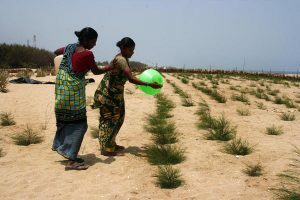 By acting as a buffer zone during extreme natural events, coastal vegetation can mitigate damage and even save human lives. One such coastal plantation which protects coastal areas from tsunamis, high tides, storm surges and cyclones is the bioshield. 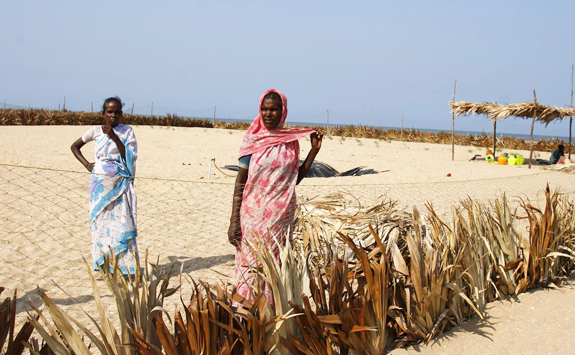 SEEDS promotes a multi-layered and multi-species bio shield in coastal villages. Our biosheilds projects are designed in a way that ecological security of coastal ecosystems and the livelihood security of coastal communities complement each other in a mutually reinforcing manner. The community is consulted and the types of trees that are planted are done so based on their preference. Community involvement is one of the critical factors in the success of such projects. This ensures a noticeable change in the perception of the communities towards bio-shields; an understanding that their presence is key to protecting the settlements from natural disasters. Not all stakeholders are aware and informed about their vulnerability and the measures they can take to pro-actively adapt to climate change. Raising awareness is therefore an important component of the adaptation process to manage the impacts of climate change, enhance adaptive capacity, and reduce overall vulnerability. SEEDS targets institutions such as schools through media kits and posters, as well as field practitioners through knowledge resource tool kits. SEEDS has also initiated “Eco Clubs “and “School Safety Clubs” in schools as tools of awareness building. We have conducted several regional workshops and study of climate change hotspots. These help us to understand the mitigation and adaptation strategies practiced by local communities due to changing climates. 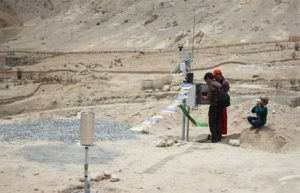 We have also set up a community radio programme, automatic weather station, climate school with the aim on engaging communities in debates and discussions on core issues around climate change and help them in gather information on their micro-climate and engage collectively to find local solutions to these problems.